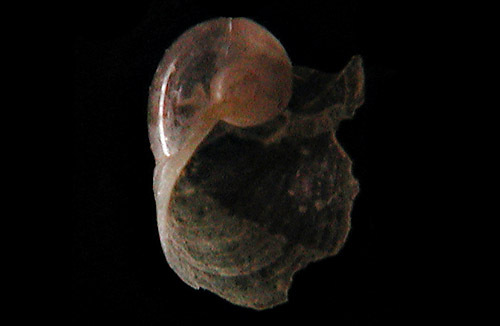 Identification: The remaining portion of the shell is similar to the apex of other listed Chelidonura spp. shells. However, the protoconch is approximately twice the diameter of the protoconch in those species. Natural history: Chelidonura(?) sp. #3 is known from only two damaged shells found in sand samples from depths of 58-61 m (190-200 ft). Taxonomic notes: First recorded in Hawaii from off Makena, Maui by CP; in sand samples provided by Mike Severns and PF on Dec. 4, 1991. Photo: CP: remaining portion, 1.1 mm: from sand sample provided by Mike Severns and PF: off Makena, Maui; Dec. 4, 1991.